When I was in college, I had a dorm-mate named A. Patel. He was a nice, smart guy. He told me that he was from the suburbs and his parents ran a motel. 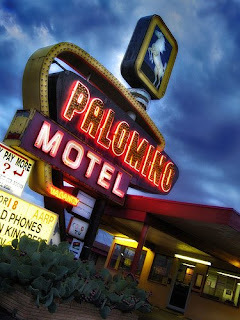 He lived with his brother and parents at the motel. 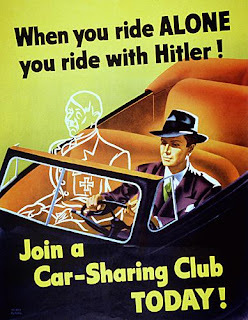 Back then, I thought that was a bit odd. But I should have known better. Ancestral homeland of many a motel tycoon. 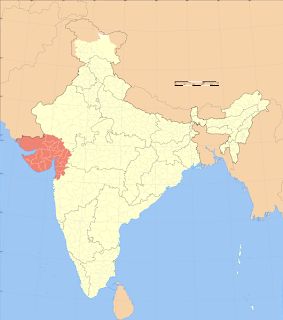 Millions of Patels live in Gujarat, an Indian state which abuts the Arabian Sea. During the British colonial period, many Patels moved to East Africa to become successful merchants. During the turbulent 1960s and 70s, many Indians fled East Africa, eventually finding their way to America. At the same time, white mom and pop owners of motels in America were retiring. 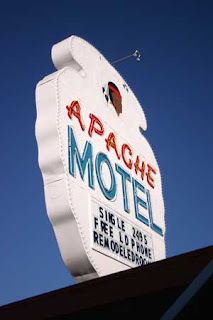 Indians, including Patels, bought these motels. 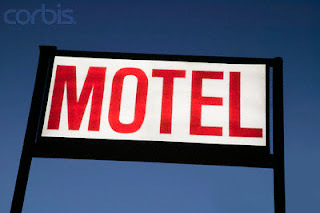 Now, 60% of all small to mid-sized motels are owned by those of Indian origin. 70% of those owners are named Patel. This, in a country in which Indians constitute less than 1% of the entire population. 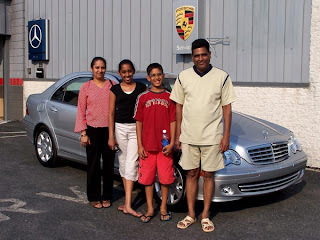 Patel family and their Merc. 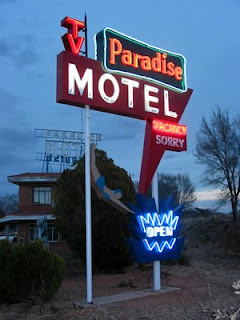 They got into the motel business because fluency in English is not required, hard work is key, there is good cash flow, family members can all work together, and the family can live at the motel. Many Patels worked their butts off and after many years, began living the American Dream. Prejudice, especially in small towns, was inevitable. 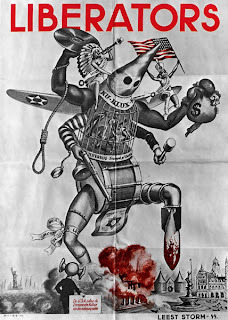 It got worse after 9/11. 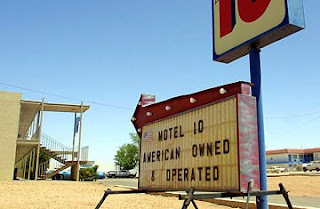 Non-Indian owners often touted their motels as being "American owned". 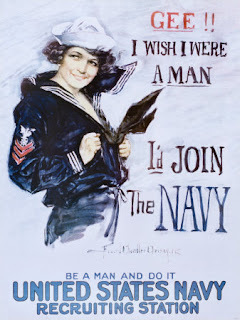 But what is more American than achieving success through years of hard work and perseverance through adverse conditions? 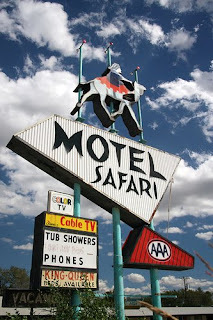 Cheesy Cuisine: Del's Restaurant in Tucumcari, New Mexico. My first food stop was at Del's. Whenever I travel, I look for something local and something I've never had before. The word SOPAIPILLA screamed at me from the menu. I asked what it was. Sopaipilla is a unique New Mexican, and arguably Texan, food. It is bread stuffed with seasoned ground beef and peppers, deep fried, and covered with cheddar and jack cheese. Sides of beans and rice are not uncommon. I of course order the sopaipilla and a cup of the pinto bean soup, which was essentially just a small pile of pork flavor infused, cooked (bordering on mushy) pinto beans. The "soup" was delicious and I scarfed that down. Then the entree arrives. I am a big eater. I am no Joey Chestnut, but I can hold my own. My entire plate is smothered with a thin but potent layer of yellow and white cheeses. I take a stab at the sopaipilla. It is delicious but quite salty. I finish the sopaipilla, the cheese on top of the sopaipilla, the rice, and the beans. I am full. The thing is, there is a second, cheese-covered sopaipilla left on my plate. I feel like fainting. I immediately crawl out of the restaurant and buy stock in that medical device company that makes heart valve stents. If this is what Americans are eating on a regular basis, God help us. 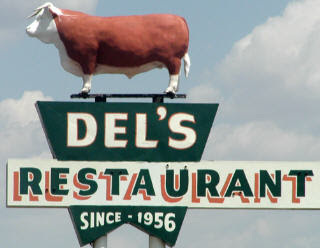 At Del's, an entire cow can be ordered as an appetizer. 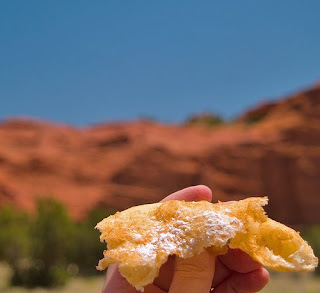 Borrowed Cuisine: Fry bread at the Laguna Pueblo reservation. It is telling that the most popular Native American "dish" is fry bread, which is made of lard and flour, two very un-Native ingredients. It was invented in the 1800s out of necessity. First Americans were forced onto reservations and given rations of flour and lard. Fry bread was an inevitability. I got mine at the Laguna Pueblo reservation 40 miles west of Albuquerque. It came with a choice of three toppings: honey, cinnamon, and powdered sugar. I opted for the honey. It was light, fluffy, a little chewy, and delicious. Unfortunately, after only two bites, the fry bread (and the paper plate it was resting on) flew away in the strong wind and landed on the dirt parking lot next to a beat up Ford Focus sedan. 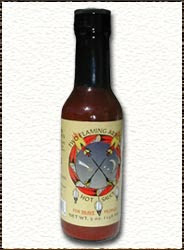 Commercialized Cuisine: Two Flaming Arrows hot sauce. Having just lost my lunch (the fry bread), I mopishly shuffled across a dirt road to a flower shop/souvenir store. There, I found bottles of local hot sauce (Two Flaming Arrows brand) for six bones a bottle. The label said it was bottled locally on behalf of the Laguna Pueblo Indians. The lady at the store told me it is only sold locally. The sauce is actually pretty good. It is not flaming hot and it is a little sweet (from the honey). But when I got home, I found bottles of these for sale on the net for $4.50 a bottle. 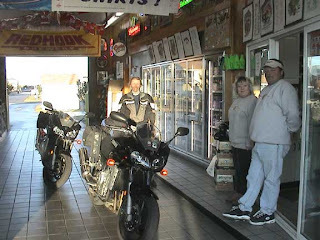 Hypocritical Cuisine: Earl's Diner in Gallup, New Mexico. What I ate at Earl's was not hypocritical. But the experience reminded me of our collective hypocrisy. 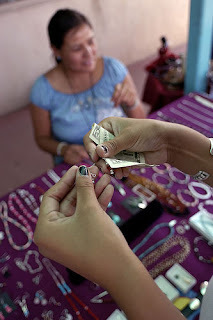 At Earl's, local Native American vendors go from table to table, selling jewelry to patrons. We were approached by a six year old girl, a ten year old girl, and an older lady who was barely able to walk without a cane. They were all trying to survive by selling trinkets to tourists. 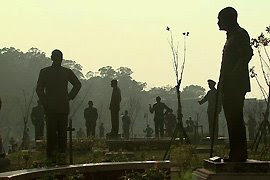 The abject poverty was appalling and inexcusable. Why is this hypocritical? While we stand on our soapbox and angrily denounce China for its treatment of Tibet and its people, we fail to remember that our country gave smallpox-infected blankets to First Americans, stole their land, and marginalized them to the extreme. 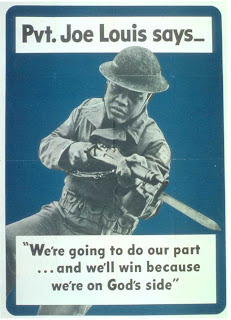 Before we criticize others, let's take stock of what we have done (and are still doing). 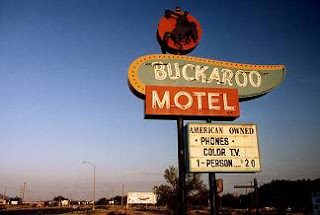 When we stumbled upon Tucumcari, New Mexico, late one night, we just wanted a room, any room. 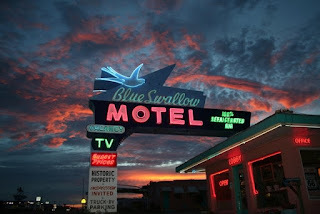 The plethora of motel neon signs in this historic Route 66 town floored us. The cheapest room for one person cost a mere $19.95. Alas, we opted for a Holiday Inn Express. As much as I criticize our government and consumerist culture, I love America. On my last road trip, I visited Arkansas, my 50th state. Without waving an American flag or asking that God bless America, I give you my 10 favorite American sights, foods, and experiences. 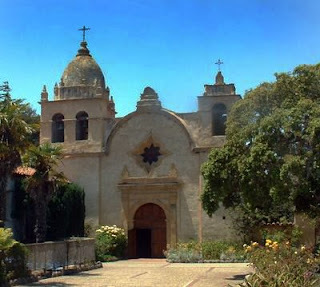 California: The 21 Spanish missions from San Diego to Sonoma. Hawaii: Sailing across the Auau Channel between Maui and Lanai on a clear blue day. Maine: Eating a lobster roll at McDonald's. Nebraska: Hiding from a tornado at a Lincoln bar where football and BBQ are king. 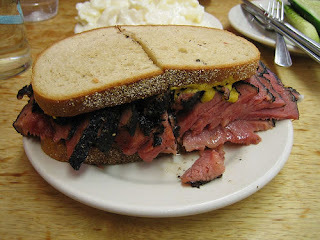 New York: A pastrami sandwich from Katz's. North Carolina: Stocking up on beers and ice on a hot summer day at a Brew Thru-- a drive-through refrigerator/liquor store. Utah: Eating a bologna sandwich with French's mustard on white bread at a diner run by a Mormon family in St. George. West Virginia: Bubba, the John Popper look-a-like who graciously fed me and gave me hope and support on one of my darkest days. Tamerlane just completed his 7th cross-country road trip. It was scary (driving through rain at night with subpar wipers and headlights), frustrating (chariot broke down in Grants, New Mexico), sad (young Native American children and one very old lady hocking jewelry at an Indian reservation), surprising (finding best sesame chicken at Sunrise Chinese Super Buffet: House of the Mongolian BBQ in Sawnee, Oklahoma), and weird (getting assigned rooms 227 and 333, twice each, at different hotels in different states). 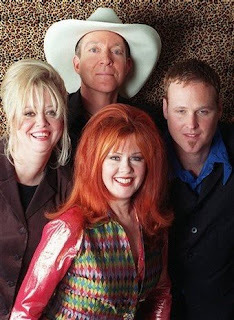 The journey started in Athens, Georgia, home of the B-52s and REM. I had no idea where to have breakfast so I just pulled up to the first restaurant that looked open. I happened upon the Bluebird Cafe. None of the B-52s showed up for breakfast while I was there. When I entered, I realized that I was the only customer. Bad news. Near the door, I had a choice of two alternative weekly papers which are obligatory in any college town/liberal metropolis. The paper I picked up had an article about whether the governor was going to allow sales of liquor on Sundays. Yeah, this is the Bible Belt. I look over the menu and see "soysauges". In a panic, I scan the entire menu for meat products. I find none. Since my waitress had already brought my coffee, I realized it was too late to leave. So I ordered the Spanish omelet. It was delicious. The omelet had onions and tomatoes that were as fresh as could be, and no doubt locally grown and organic. The vegetables could have been cut into smaller pieces but that is a minor complaint. What I enjoyed even more were the home fries. They were a little undercooked (read: crunchy) but the spices in them were familiar and foreign. It tasted like a melange of your favorite items at an Indian lunch buffet. Tumeric, cumin, etc. It's all there. As I sat and enjoyed my meal, the cafe filled up quickly. I guess it's not much of a secret to locals. 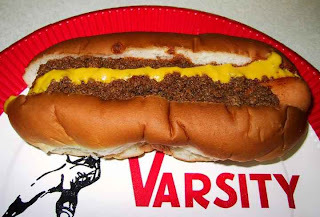 After a morning exploring Athens, I headed to the local Varsity franchise for a couple of dogs. This venerable institution is known for its slaw dogs (cole slaw on hot dogs) and its African-American cashiers yelling: What'll Ya Have. I learned about it from a PBS show about hot dogs and was instantly intrigued. I was sorely disappointed by my experience. First, the cashiers were all clinically depressed. 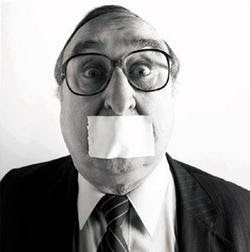 Once every five minutes, as if required by the employee handbook and prompted by an egg timer, one of the cashiers would soullessly mutter: What'll Ya Have. It really bummed me out. I didn't want to stay. But I did. I ordered a chili dog and a slaw dog. The chili and line of mustard on top of my chili dog were bland as can be. Had I eaten it blindfolded, I would have guessed that I was eating a hot dog with a warm blended cardboard slurry on top. The bun was cheap and processy. The dogs themselves were forgettable. 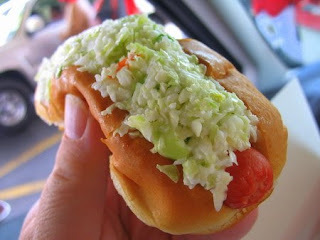 The slaw dog was no better. The lettuce chunks were lifeless and all I could taste was watery mayo. The highlight was the small Coke I got, which was served in a small paper cup holding no more than 4 to 6 ounces. At least they got portion control right. It is as bad as it looks. In Atlanta, I dined at Wahoo! Grill in Decatur. 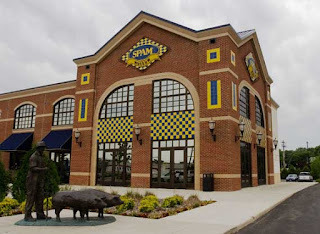 It is a seafood joint popular with the Audi-driving, latte-drinking, Obama-voting crowd. You know what I mean. Seeing as I was in the South, I opted for the Charleston Shrimp & Grits. On a scale of 10, I'd give it a 7. The entree's base is a generous pile of white cheddar grits. I'm not an authority on grits, but it was pretty damn tasty- both in flavor and consistency. It was topped with sauteed shrimp that had been simmered in a spicy tomato cream sauce, or at least that's what the menu said. The shrimp was not particularly fresh but not bad either. The sauce was very mild, perhaps subtle, but definitely not spicy, tomato-ey, or particularly creamy. So we've got an above average meal food wise. 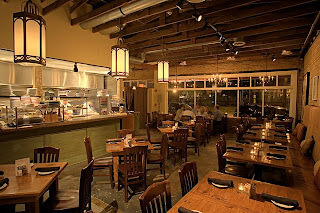 What made this restaurant shine was the atmosphere and ambiance. Once you walk past the shallow and cluttered entryway, you enter a modern yet comfortable setting that was obviously converted from a warehouse or machine shop (with exposed air ducts and beams overhead for proof). There is a warm feeling. It is crowded but not overly noisy. 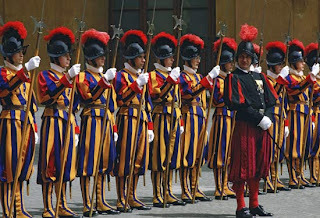 The staff was attentive and competent. All in all, I would recommend it. During a recent trip to Athens, GA, I was pleasantly surprised by the abundance of foreign, and sometimes exotic, metal plying the streets. I saw a Defender 110 and a Porsche 928 GT4, both in very good condition, parked downtown. I also saw a college kid driving what I would hope is his dad's Merc W221. 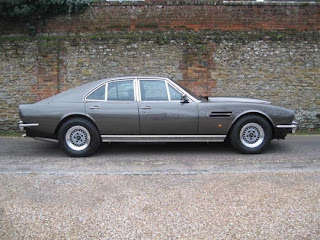 While perusing the auto mags at an Athens Borders (they are everywhere and all carry the exact same inventory), I came upon an Aston Martin I had never heard of before, the Lagonda V8 Saloon. No, this is not the wedge shaped saloon with the Star Trekkie CRT dash. 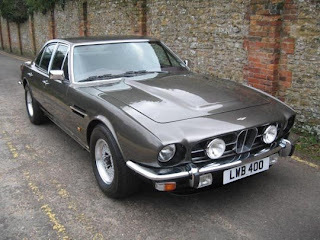 This is a 1974 Aston Martin V8 with a stretched wheelbase and a couple of extra doors. Though this 160 mph super saloon was perfect in many ways, the Middle East oil crisis killed its chances of success. Only seven were ever built. The grill is a little too busy. The Oscar India rear mod is a nice touch. 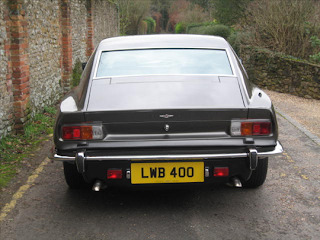 Great rear 3/4 angle shot. 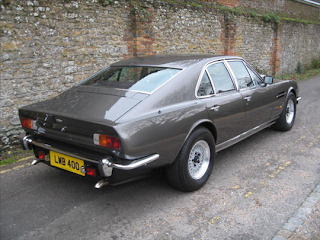 How did this two-door Lagonda get here? Despite vigorous finger wagging by foreign politicians, the Chinese continue to crack down on Tibetan dissent with a massive amount of troops. In Taiwan, the Chinese crackdown has the effect of helping the DPP's chances of keeping the presidency and the passage of the DPP-backed U.N. referendum. The KMT candidate's once insurmountable lead has been almost completely wiped out as events unfolded this week in the PRC. 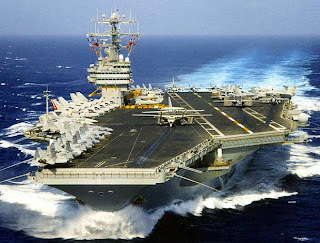 Coincidentally, the USS Nimitz and USS Kitty Hawk will be conducting training exercises right next to Taiwan this weekend during the election. 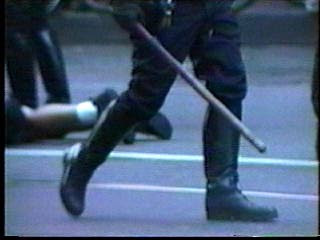 If the DPP referendum passes, there is a small, but real, chance that the PRC may attack Taiwan. So who can the people of Taiwan count on for "official" support? The answer is quite pathetic. Let's hope people on both sides of the Taiwan Straight think and act reasonably this weekend. 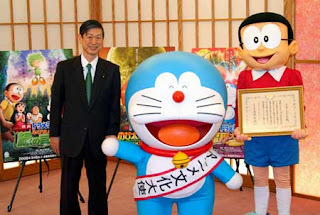 The Japanese Foreign Minister, pictured, just named Doraemon Japan's anime ambassador. 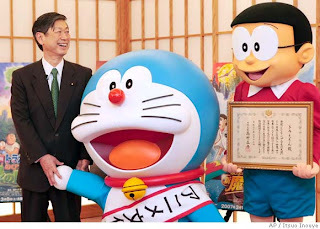 No word yet on Hello Kitty's appointment to the Japanese Supreme Court. On April 9, the Olympic torch will make its only North American stop-- in San Francisco. Hundreds, maybe thousands, will protest. But their voices will be muffled. Why? The torch relay organizers are releasing the relay route as late as possible. Permit applications by human rights organizations to assemble in San Francisco have all been rejected. The police will designate "free speech areas" "associated with the route" for protesters. 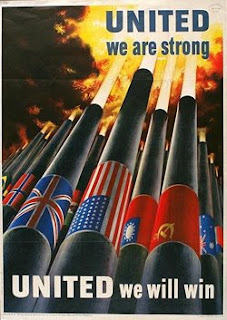 It seems Mayor Newsom has learned a great deal about political freedoms from his Red Chinese counterparts. I believe the best strategy is to place protesters with hidden signs, banners, and flags at strategic positions throughout the city: the Golden Gate Bridge, Fisherman's Wharf/the Embarcadero, Lombard Street, and Chinatown. The relay will inevitably pass these landmarks. At just the right moment, the protesters can unfurl their signs, banners, and flags and shout away. The media will love it. As a side note, I looked up the torch relay route in China. First, Kashgar has been taken off as a torch stop recently. Furthermore, Lhasa and Mt. Everest continue to be on the schedule. 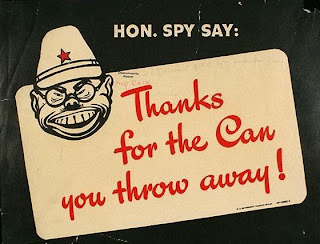 All I have to say to the Olympic organizers and the Chinese government is: Good luck with that. 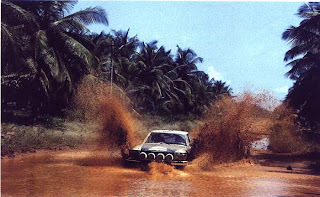 "Mercedes Never Made A Rally Car." 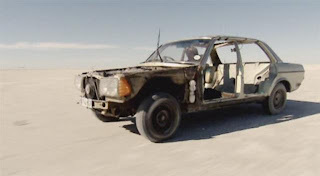 On last night's Top Gear, the dynamic trio drove a 1963 Opel Kadett A (Hammond), a 1981 Lancia Beta (Clarkson), and a W123 Benz 230E (May) across Botswana. 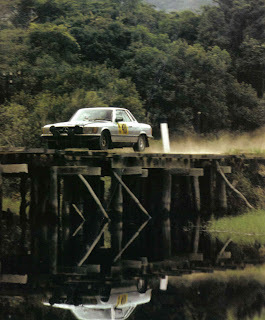 Laughing at the Merc's long wheelbase and general tubbiness, Clarkson noted that's why Mercedes never made a rally car. I'm pretty surprised that he made the comment and even more surprised that the Top Gear staff kept it on the air. The R107 450SLC 5.0 was an odd bird. 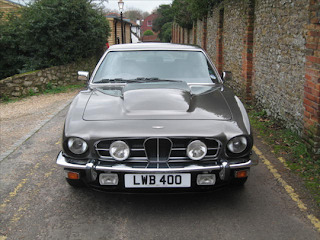 It was HEAVY, had a powerful V8, and had an automatic transmission. Not your typical rally car. 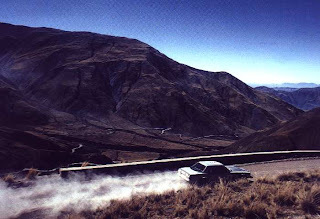 Between 1978 and 1981, Mercedes spent a lot of money in rallying from Portugal to New Zealand. With extravagances such as servicing via helicopter, it was rumored that Mercedes spent more per event than Ford or Opel spent in an entire season. 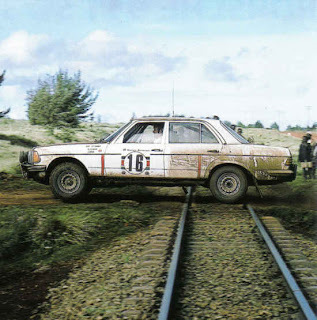 What is even more remarkable is that during my research, I found out that a W123 280E won the London to Sydney rally in 1977. This is essentially the same car May drove from Zimbabwe to Namibia. Who says Mercedes never made a rally car? Is Xinjiang (East Turkestan) Next? !